remember it’s easier to die for the revolution than to live for it’. Abdullah’s frustration stemmed from his struggle in trying to find a group of volunteers to continue the revolutionary work of political organizing and attending to the immediate needs of the disempowered and the poor. If everybody could just give two hours every day – live the revolution for two hours every day – things would be drastically different, he said. Farha Ghannam compares and contrasts the aftermath of two deaths of young men, one of whom went on to become a martyr to the revolution, and the other did not. Ghannam explores the nature of the Egyptian notion of “the good death” (ḥusn il-khatma), how narratives of good death are created as accounts of the deceased person’s relationship to God and community, and how these narratives cn be inflected with the discourse of martyrdom. In addition to the articles on Egypt, there is a paper by Joel Rozen on revolution-era deaths as they live on in Tunisia’s current state history curricula, and a paper by Andreas Bandak on on Syrian Christians and their ways of perceiving the materiality of death. Death lies at the beginning of the Arab uprisings and continues to haunt them. Most narratives about the ‘Arab Spring’ begin with Mohammed Bouazizi, a Tunisian fruit vendor who set himself on fire. Egyptian protesters in turn referred to Khaled Said, a young man from Alexandria whom the police had beaten to death. This special issue places death at the centre of its engagement with the Arab uprisings, counterrevolutions, and their aftermaths. It examines martyrdom and commemoration as performative acts through which death and life are infused with meaning. Conversely, it shows how, in the making, remembering, and erasing of martyrs, hierarchies are (re)produced and possible futures are foreclosed. We argue that critical anthropological engagement with death, martyrdom, and afterlife is indispensable if we want to understand the making of pasts and futures in a revolutionary present. Taking the deaths of two young Egyptian men as its starting point, this paper traces ‘technologies of immortality’ and the possibilities they promise to the deceased and their status in the grave and afterlife. Extending Foucault’s notion of ‘technologies of the self’ beyond its this-worldly focus, technologies of immortality aim to account for the rituals, practices, discourses, and images generated by community members to positively impact the fate of the deceased. 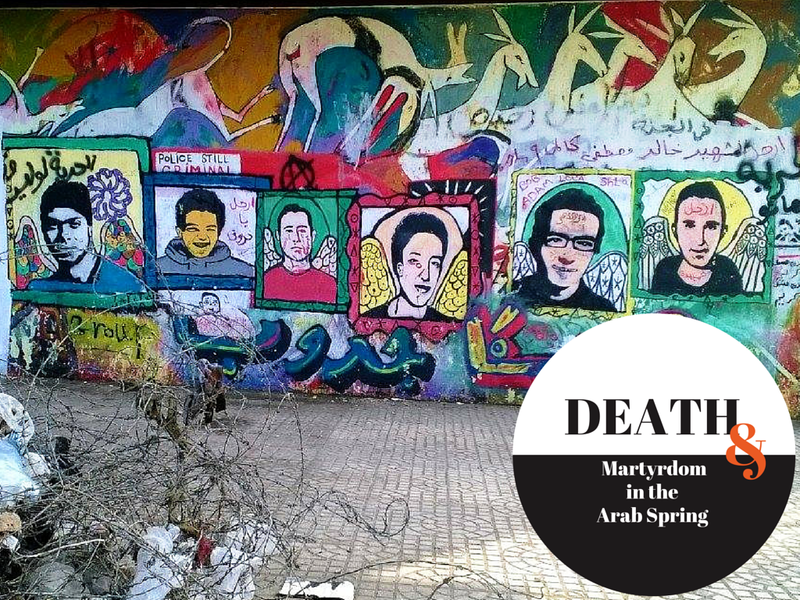 Looking closely at ‘death narratives’, their repetition, circulation, and anticipated effects, I explore how the living collectively and performatively produce martyrs and their good endings in Cairo, Egypt. The military regime that seized power in Egypt in July 2013 has suggested that the security personnel, rather than the unarmed protestors who died in the 25 January 2011 uprising, were the martyrs that the nation should celebrate. This rhetorical claim in support of authoritarian suppression of dissent must be understood in the context of the popular culture of the immediate post-Mubarak period, particularly the ‘martyr pop’ music video clips. This mass-media form disseminated a strategically ambiguous rhetoric that celebrated the martyrs but largely ignored the political cause for which they died. Such depoliticization of martyrdom suited the sensibilities of the intellectual class, whose economic and political investments in the hegemony of the neoliberal state outweighed their stated commitments to political change. Ghannam, Farha.2015. Technologies of Immortality, ‘Good Endings’, and Martyrdom in Urban Egypt. Ethnos 80(5): 630-648. Gilman, Dan. 2015. The Martyr Pop Movement: Depoliticizing Martyrdom. Ethnos 80(5): 692-709. Mittermeier, Amira. 2015. Death and Martyrdom in the Arab Uprisings: An Introduction. Ethnos 80(5): 583-604. Ramzy, Caroline. 2015. To Die is Gain: Singing a Heavenly Citizenship among Egypt’s Coptic Christians. Ethnos 80(5): 649-670.